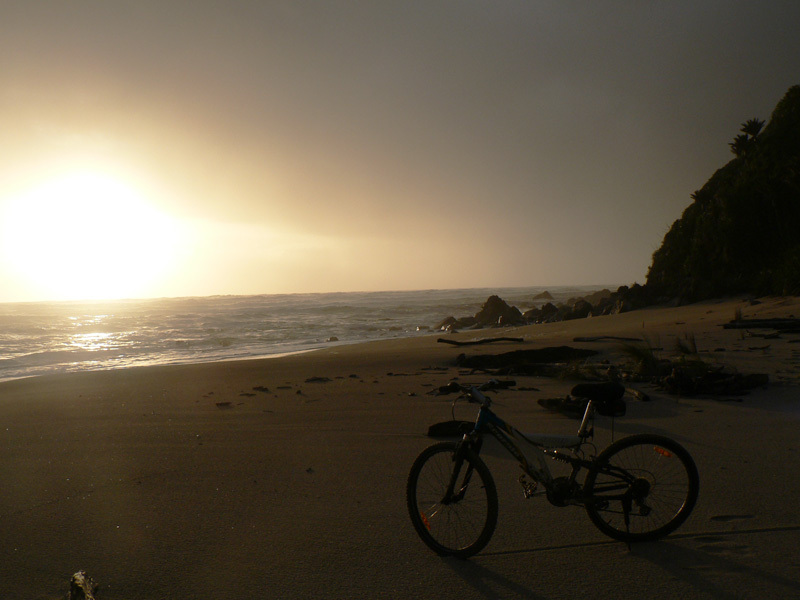 Phase one of a three year trial draws to a close as mountain bikes are no longer permitted on the Heaphy Track. While the trampers have the Heaphy all to themselves, the bikers have until next May to plan their next Kahurangi adventure. The policy makers will sift through the statistics gleaned from the five month trial and determine the success and impact of close to 2000 riders on the great walk. IF testimonials are anything to go by, the trial has been a roaring success as trampers have waded in behind the bikers with support for their cause. Bar some early reports of aggression from gun-ho riders, it seems both parties can enjoy the Heaphy in peace and as a unit can expect better facilities (new huts) and higher maintenance from DOC, to the benefit of all. In terms of conservation, there are no reports of flattened kiwis or snails, a factor that will be a significant pro in the bikers pitch. As for wear and tear, there has been some notable rucking around the Lewis and Heaphy river flats. 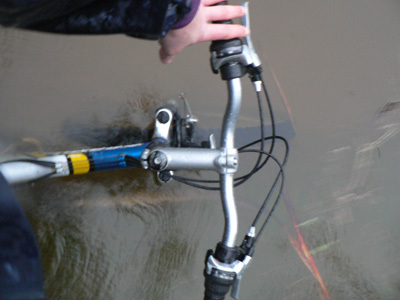 Sections of the McKay descent are mud traps, snaring front wheels and testing the tenacity of both bike and rider but, by and large, bike wear and tear pales in comparison to the influence of the tides and flooded rivers on the track. So, the Heaphy Tracker verdict for year one - dual usage is fully possible. Enjoy the Summer and we'll see ye back in Karamea in May. 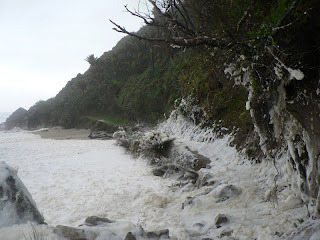 Here's some idea of what awaits you on the western front of the Heaphy Track. 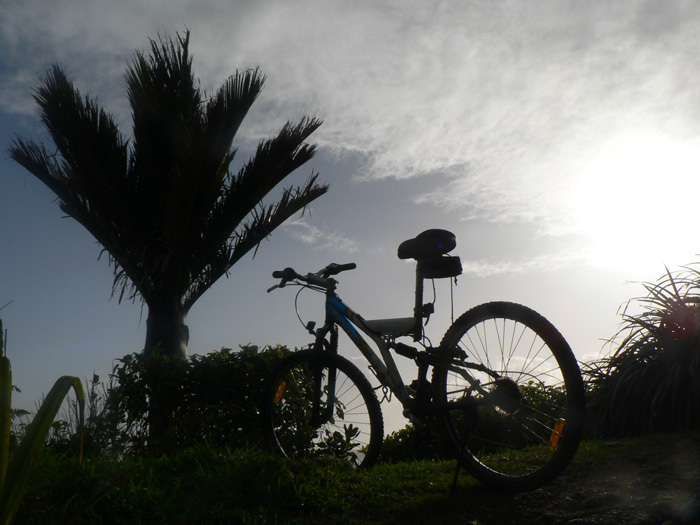 Written from an eco-tourism perspective, the scene depicted below also applies to Heaphy riders. 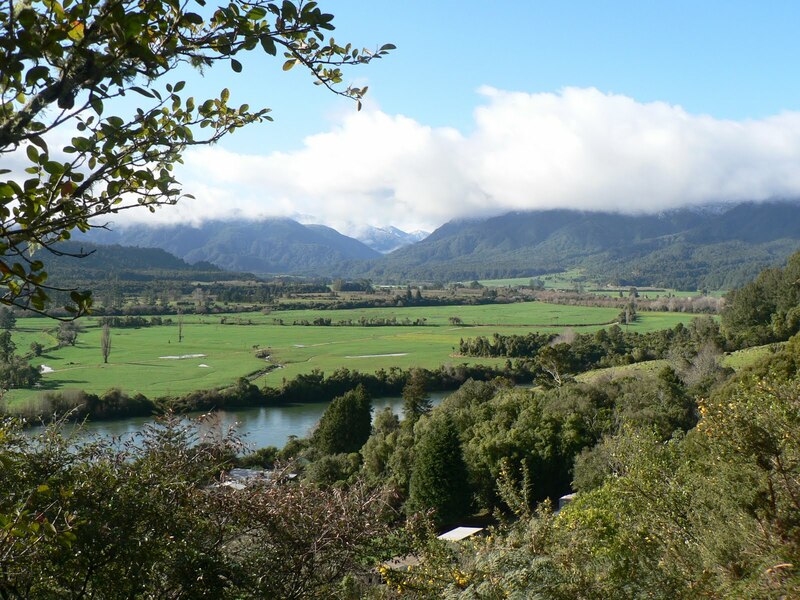 By luck or design, you have discovered Karamea on the West Coast of the south island. You will see from your map that it is both the end of the road and a 100km tangent from the accessible loop that is Nelson, Greymouth, Christchurch. The guidebooks will entice you with promises of unspoilt native bush and the massive Oparara limestone arches but, unless you are a geologist with botanical leanings, will you break the cycle and take the road less travelled north? There are precious few expressions profound enough to describe the Karamea effect but after nearly 10 years of travelling that northern route, I have summarised the experience thus; A winding mountain road you will travel, and, where you crest the brow of the ridge, you will enter a world where man and nature live silently and slowly together, guided by the pulse of the planet. Hemmed in by mountains to the north, east and south, the plateau that is known as Karamea is carved by the mighty rivers that flow from the deep mountain gorges. The landscape undulates westward where it is peeled back by the raging currents of the Tasman Sea and 35kms of white sand beaches are interrupted only by lagoons and wetlands. The inland horizon consists of continuous mountain ridges, covered by dense, sub-tropical rainforest. The offshore horizon, when viewed from the summit of the Karamea’s closest peak, Mt. Stormy, is a glimpse at the curve of the earth and a nod to man’s impotence in the face of such a wild environment. Having moved from Ireland, the scale of the setting continues to refresh itself in my eyes. There is no end to appreciating the diverse beauty of this place. I was accustomed however, to history being evident at every turn. In Karamea, it largely travels in one line along the old Greenstone trail, where the early Maori followed the coast south in search of the sacred stone. This is no less a depth of history than Ireland’s, particularly as the setting of the trail has changed so little since those early footprints. The culture, as we know it today, was born when a selection of emigrants from Europe were sent to settle the land in 1874. Ever before sustainability was part of the agenda, the pioneers who landed on the banks of the Karamea River sowed a seed of survival that flourished through the ages and rings through to the present day. The locals, fierce in their pride of place, have nourished the skills and ethos required to live here and impart their ways to the newcomers who have come to the end of the road. Karamea offers a range of organic and sustainable products; biogro certified tea tree from True Blue Organics, feijoas, tamarillos, and passion fruit from Moynihans Overflow Orchards and home-grown veg, meat, eggs, herbs and fruit from most establishments in town. It is a model that permeates the whole community and is probably best embodied by the Rongo Living in Peace project, a certified carbon-neutral enterprise that fosters art, permacuture and music. 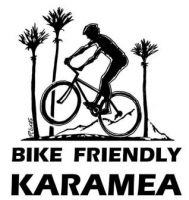 As for eco-tourism, you might as well take a whole year off if you’re coming to Karamea. Aside from endless, hiking, fishing, climbing, caving and kayaking, cycling is the new craze in town. 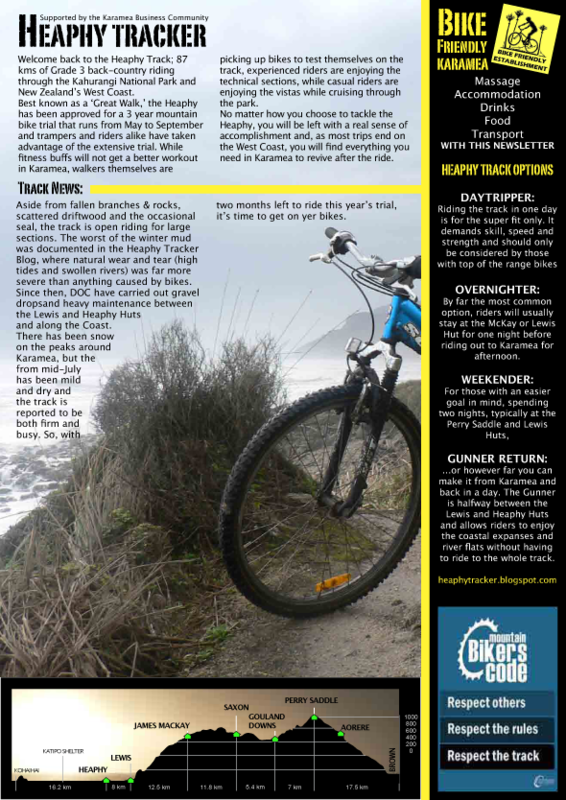 The Heaphy Track, (the renamed Greenstone Trail) the longest of New Zealand’s ‘Great walks’ is hosting mountain bikes over a 5 month winter trial from 2011-2014. 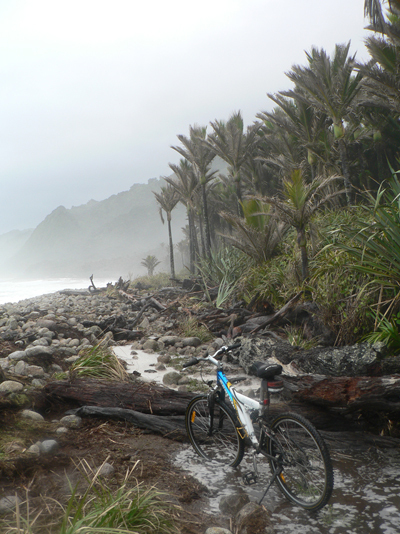 While cycling the Heaphy is by no means a walk in the Kahurangi National Park, it is an intensely rewarding experience that will leave you exhausted and pumped all at once. While the adrenalin menu bristles with appetising adventures, Karamea really stands out as a place to just simply ‘be’. It takes about a week to adjust to Karamea time, but when you do, you will see that the pace of this place will cleanse you of all your time related strains. Devoid of cellphone coverage, you will use the rise and fall of the tide and the sun to mark the passage of your day. Sunset over sea and moonrise over snowy peak becomes your nightly must-see as the need for technology and material wealth fade with the light. 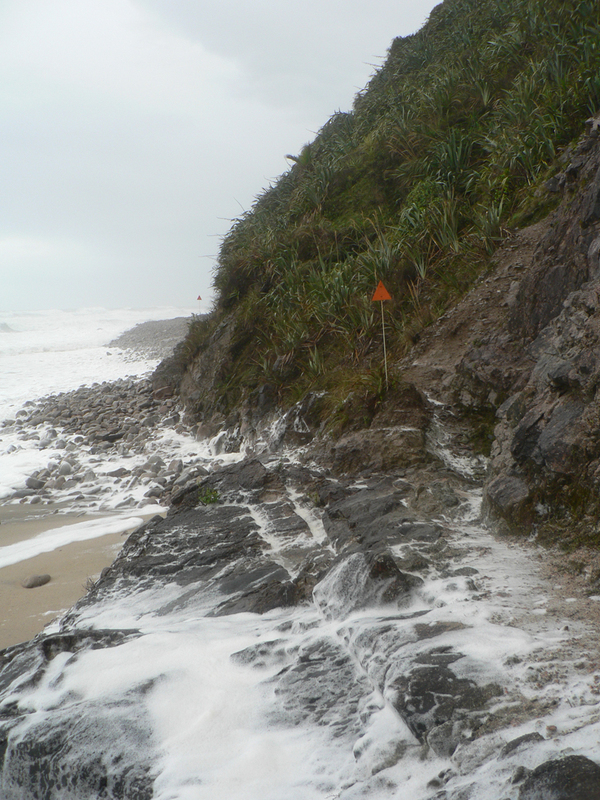 After 10 days of rain, a thunder storm that went on for about a week and hailstones like baby golfballs, now was the time to check the Heaphy track's condition at it's winter worst. I rented a bike from Outdoor Adventures in Karamea and planned a return day trip to the Lewis Hut and arriving at Crayfish point for the high tide. Leaving the Kohaihai at 8.00 I was submerged to my saddle by 8.03. A swollen Kohaihai river will flood a short section of track just over the swingbridge. But I knew that, I just ploughed into it in the interest of investigative journalism. Honest! Now, before I go any further, I would regard myself as fit (30 and lean like) but It's been a while since I've cycled uphill over mud, rocks and leaves so I didn't last very long. Going over the Kohaihai bluff I did the whole sweaty head thing, and thinking, jeez, this is hard, it's raining, early, da da da. Some fallen trees across the track were a perfect setup to wipe someone out going hard downhill. They gave off an air of caution as I carried my bike through. By the time I freewheeled into Scotts beach, I remembered why I came and we were full steam ahead on the Heaphy track. The rain cleared just as my drive chain got clogged up in sand and I found myself walking again. North of Scotts, I rounded a bend and came upon a piece of driftwood, garden table size, dumped in the middle of the track. 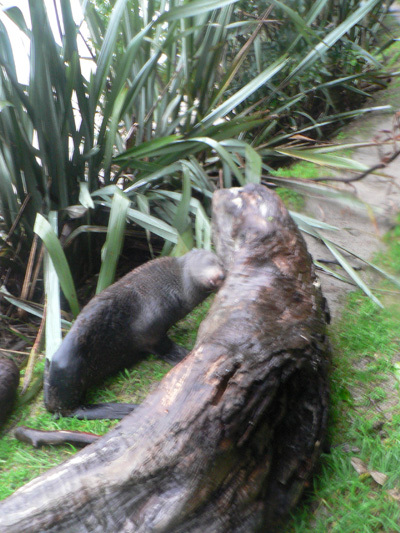 The piece of driftwood beside it lunged at me and started barking and scared the crap out of me. It was just a wee skinny seal who was taking refuge from the rough seas. The Katipo shelter was a welcome landmark. Halfway between the Kohaihai shelter and the Heaphy Hut it gives you a good indication of your progress. The sign says 2.5 hours either way. It took me 2 hours, including pictures, notes and close encounters. I was way behind and high time to get some k's under my cap. There's plenty of Nikau flats to zoom through to the Heaphy from this point. It's leisure riding, with the odd mud pool that will haul you up. Another seal refused to let me pass. He finally turned on me and the bike was a welcome front as he advanced. Heaphy to Lewis is reported to be the muddiest. 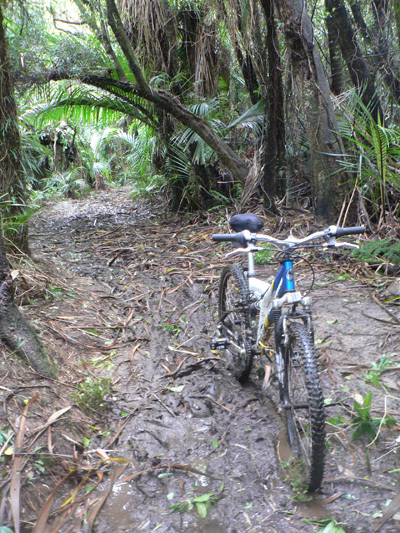 Granted there are spots where water pools along the banks of the Heaphy river that qualify as muddy, for the most part, the track is firm. If you are sharp enough, you will pick a line that avoids most of the crap anyway. Otherwise, be prepared to dismount, push/drag, remount. The Gunner swingbridge throws up a real eye opener. 31 steps to the top from the Karamea side. Again, you had better be prepared to haul your bike. A swingbridge becomes a very fitting name during a high wind. With absolutely no option of fording, the recommended method of bridge traversal is employed. With front wheel in the air and rear wheel leading the way, you can nudge the bike over the steel supports by bumping you knees against the saddle. While holding the handle bars your flapping elbows should be braced against the guy wires for support. If you have a carrier with something like a tent strapped onto it, you are in for a tough time and good luck to you. I reached the Gunner at 13.00 hours, having picked up the pace. I counted my first sandfly of the day while gnawing at a ham roll. I was half way between the Heaphy and the Lewis and decided that it was time to head back before sundown. On the ride home I marveled at how people can ride the entire Heaphy in a day, Rather than it being frowned upon, I regard it as being admirable to partake in that kind of endurance for the sake of adventure, exercise and hobby. And without doubt, the highlight of the Gunner return was the descent to the Kohaihai where, after battling headwind home along the coast I really let her rip on the downhill. I found myself taking jumps and bends like a pro. The whole concept of 'technical' came to mind as I picked a line through the drop. Good thing the DOC dude cleared those fallen trees on the way out as I had completely forgotten about them in my pursuit of the finish line. I peeled my sodden thermals off in the Kohaihai sunset sky. Under the worst weather conditions but with the correct attitude and preparedness, the Gunner return was a massive success and left me shattered but buzzing. What a trip!